For more than 25 years, the Catholic Church in the United States has made a special effort to reach the Hispanic community, with programs and resources that flow from archbishops’ offices to local parishes. In many ways, that effort has paid off. In 1970, Archbishop Patrick Flores became the first U.S. Hispanic bishop. Today, there are 26 active Hispanic bishops (roughly 10% of all active bishops) and about 450 Hispanic seminarians at the graduate level of training for the priesthood (about 14% of all seminarians at that level), according to the Center for Applied Research in the Apostolate (CARA) at Georgetown University. But the degree to which the church has succeeded in keeping Latinos in the pews is less clear. 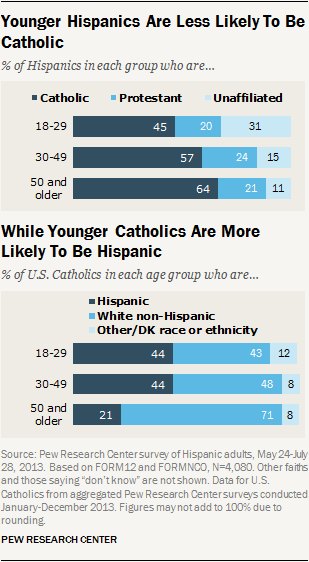 On the other hand, the percentage of all U.S. Catholics who are Hispanic is increasing. A recent study of Catholic parishes with Hispanic ministries from Boston College and CARA reports that Latinos made up about one-quarter of U.S. Catholics in the 1980s, and are about 40% of the Catholic population today. In our surveys, as of 2013, one-third (33%) of all U.S. Catholic adults were Hispanic. That paradox is possible because of the growing size of the Hispanic population, which has increased from 12.5% of the total U.S. population in 2000 to 16.9% in 2012. If both trends continue, at some point in the future, it is possible that a majority of U.S. Catholics will be Hispanic even though the majority of Hispanics will no longer be Catholic. The share of Hispanics who are Catholic likely has been in decline for at least the last few decades, according to long-term trends in the General Social Survey, and the movement of Hispanics away from Catholicism is not limited to the U.S. In some Latin American countries, evangelical Protestant churches have been gaining members and the share of those with no religious affiliation has been growing. But the declining percentage of Hispanics who are Catholics also reflects religious changes taking place in the U.S. general public, where Catholicism has had a net loss of adherents through religious switching (or conversion) and the share of the religiously unaffiliated has been growing rapidly. Three-quarters of Latino adults in the new survey (77%) say they were raised as Catholics, while just over half (55%) currently describe themselves as Catholics. Roughly a quarter of Latinos were raised Catholic and have left the faith (24%), while just 2% were raised in some other faith and have converted to Catholicism, for a net decline of 22 percentage points. In addition to the Hispanics who have already left the Catholic Church, a growing share of Hispanic Catholics in the U.S. say they could imagine doing so someday. While two-thirds of Hispanic Catholics say they could never leave the church, roughly three-in-ten (29%) say they can imagine leaving Catholicism – up from 21% who said this in 2007.